McLaren boss Martin Whitmarsh believes Sunday's first corner accident at the Belgian Grand Prix should act as a reminder of how dangerous Formula One can be. 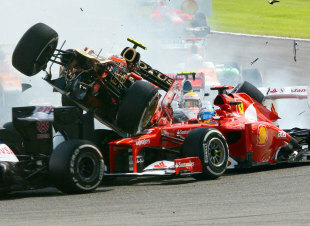 Romain Grosjean triggered the accident immediately after the start as he veered into Lewis Hamilton's path and then became airborne over the back of Sergio Perez's Sauber. As he flew through the air his car came perilously close to Fernando Alonso's helmet and all four cars were taken out of the race. Fortunately none of the drivers were badly hurt, but Grosjean was issued with a one-race ban for his part in the accident. 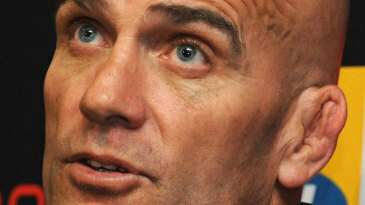 "It looked scary," Whitmarsh said after the race. "I think we've become slightly nonchalant. We see so many big enormous shunts and we're used to the driver just popping out, but you realise that they can come inches from not popping out of the car. It's fortunate for him [Alonso] and fortunate that we got away with the accident today." One safety measure that has been discussed by the FIA is a cockpit canopy to protect the drivers' head, but Whitmarsh said any changes need to be fully thought through. "I think we've got to try and do more," he said. "I don't like closed cockpits myself, but we've got to think through what we could have done. I think people underestimate what a [closed] cockpit would have to be and how it could make the situation worse. You put this glass bubble over the driver, but you can't assume that they're safer. A lot of work went on in aviation and it's amazing how difficult it is to protect a driver or a pilot and allow them to see through it in an undistorted manner. There's all sorts of other incidents with cars overturning or fires in the cockpit [that could be worse]." As for Sunday's accident, Whitmarsh, speaking before the stewards' penalty was issued, said it was clear who was to blame. "Lewis was as far right as he could clearly be and you've got to feel sorry for Lewis and you've got to feel sorry for Fernando and the others," Whitmarsh said. "Grosjean seems to be making a bit of a habit of it. I'm not sure what he was thinking, he could see Lewis and he could see everything around him so I don't know quite what was driving his decision. It didn't look like he was being squeezed on his side so I don't know what brought that contact about. You had two title contenders taken out in the first corner and quite a few others badly affected as well. It's pretty frustrating."